This is one of the many traditional recipes which rules the kitchen cabinets during rainy days and wintry nights in South India. The place where I come from has very hot summers and wild monsoon rains. Every summer, eating cartons of golden mangoes and spending most of our time at our grandma’s place, I have grown up with watching my Amma and grandma prepare hundreds of Happala (Papadam), Sendige and Majjige Menasu which is also called as Balaka. It's a bit of pain to prepare these munchies in scorching heat. But, at the same time very rewarding in heavy monsoon days. The simple pleasure of munching sweet and spicy Papadams with a hot cup of coffee, while rain drops danceing to the tunes of heavy thunders are some of best days of my life. 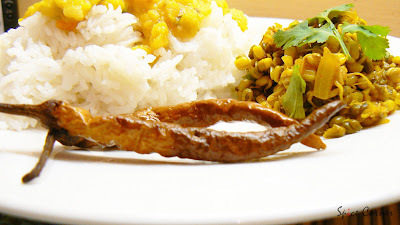 Thud… Coming back to reality, here is a HOT recipe for preparing Balakas (Dahi Mirchi). This is for all who love spicy chillies especially for my dear friend Dilip who is crazy about chillies(Checkout his hot chilli recipes here). Mix salt to the sour buttermilk in a wide pan and keep aside. Take a toothpick and make small hole at one side of the green chillies (don’t remove the seeds and stem). Arrange the green chillies in butter milk in such a way that they are completely immersed in them. Keep them uncovered for minimum 3 days. After 3-4 days, arrange them in a wide plate and sun dry. It usually takes 2-3 days to lose all the moisture in them. Once again immerse them in sour buttermilk for a day and again sun dry them till they lose all the moisture. Notice the change in colour from green to silky cream with a tinge of green. Store the preserved chillies in air tight container. When required, deep fry them till they turn slight golden brown and serve with plain rice and dal/yogurt. The hottest chilli on Earth is Indian, claim four scientists. They say that the pepper called Naga Jolokia from the north-eastern area of Assam where it is grown has beaten the Mexican Red Savina Habanero, widely-acclaimed as the hottest. Can these be oven dried...I never get such good sunshine here...so was just wondering if these could be oven dried ??? Any thoughts ?? 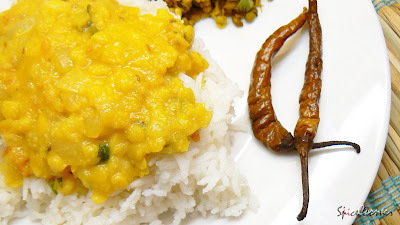 Love these dahi mirchi with dal /rasam/curd and rice. We call it mor milagai. I always used to buy this in the Indian store. never tried myself...good one and the picture is inviting. Love it with curd rice. We call it mor molagai. Always get it from my patti (grandma). The stems are the tastiest! yummm..I am going to fry a few today for dinner. Thanks! do let me know how it turns oven dried. please let me know if u cant see the pics again dear. Nice Write up!! 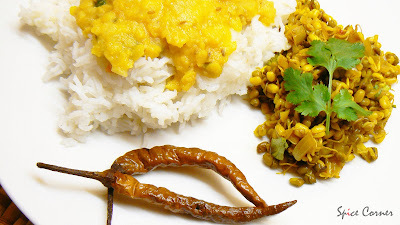 !We use to have it with dhal, sambar rice,sometimes with curd rice...but never tried at home. Excellent pair with curd rice. Last week I had masala poha with crushed majjige meNasu at my friends place. Its just good however you use it. Are there any pictures in this post? I couldn't see any. I make Balaka and Sabudana sandige when it gets 98F and more here in summer,only buy in winter.I love it with yoghrt and rice.Slurp.I see you made sprouted moong too.Yummy. I love this one. Last summer I made at home, usually my mom/ mil sends from India. We call it "Perugu Merapakayya". 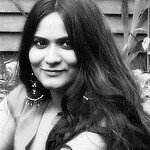 Liked your write up too Supriya,, ahhh those memories. What is Sendige ? thank u dear:) my ma usually makes it and i got this big dabba from home. its a little treasure isn't it? i got same comment from shn also. donno whats the prob is:( plz let me know if u cant see it next time when u visit dear. sabudana sendige? wow... i just love it... its so light and tasty. ashakka... sandeepa has asked me what sendige is. my brain cells are on strike at a moment;) do u know what its called in hindi/english by any chance? if u like spicy touch in ur food then u will love this girl. 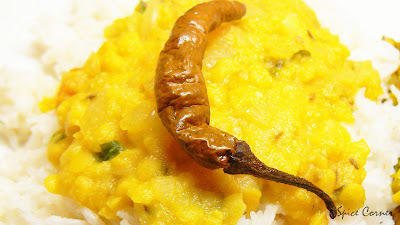 its quite spicy and eaten with mild dal and curds. remember to take small bite:) usually 1-2 will be more than enough for one meal. i am not sure what sendige is called. its actually smaller version of(very small) papads. my ma knows atleast twenty different recipes of making sendige. she makes them using rice, sabudana as asha sai, onion, garlic etc etc. u are tempting me to mak ethem at home.normally when i go to my mother's house i bring them.if it over i bought.we love them very very much.i never tried at home..will try this time..
Gawd, Supriya, you sure do bring back fond memories when you write stuff like this....all the more reason I need to go to India right?? Dahi Mirchis...I think I have had these before..they are good with all kinds of meals! Hey Sia,I just had my lunch and sat to comment on blogs.Suddenly,6 of your posts popped up in my blog roll! !I thought 'Oh dear,she is on a cooking spree in her free time' and then what do I see?! Your old posts!! !BBB,Capsicum rice,Bonda etc.I was pleasantly surprised and went thru' them all happily!They are fab. recipes,I didn't know you had BBB too. got so many posts in my draft... will start post them one after the other:) happy weekend ashakka:) will catch u soon. As for sandige, do you mean vadis (we call them vadiyalu in Telugu)? You deep-fry them in oil and they are crunchy accompaniments. Those? By the way, I'm from Assam and the supposedly hottest chilli in the world is called bhut jolokia. In fact we used to have a plant in our house and my word, are they hot!!!! My mom makes these always. I cant tell you how much I am missing them. Somehow I forgot to get it when I came here from India. Looking at your picture, my craving has started again :(. Hai,We call "Kondattam mulakku".I like to have the back part(stick)..Also we will crush that and mix with curd to have with rice..Nice presentation as usual..
sesame stuffed chillies? i have never seen or tries it. sounds quite interesting. yeah...i think vadiyalu and sendige is one and the same. they are some little treasure, isn't it? do u want me to parcel some girl? me too... i love it with curd rice. thanks for the info girl:) its really tasty isn't it?